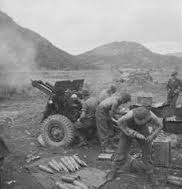 This was the main British field artillery gun of the Second World War and the Korean War. It fired a 25 pound high explosive shell but it could also fire an anti tank round and a smoke shell. It needed a crew of six to operate and could fire up to eight rounds a minute but 3 rounds a minutes was the more normal rate of fire. It had a range of 12 kilometres.